Product code: 115800 Category: ARF models. Championships in France, 1995. Shortly after the Championships ended, promotional flights were arranged to enable top pilots to fly this aircraft. The Swift has since had several successes at other international competitions. The fiberglass fuselage and rudder are finished flawlessly in white gel-coat. The canopy is glued tp fiberglass frame and comes complete with prepainted frame board. The wing is finished beautifully and ready for your aileron and spoiler servos. The foam core, obecchi sheeted, carbon fiber reinforced wings are easily removed for transportation. All these features give the Swift performance characteristics similar to a fully molded wing while still remaining very light and relatively inexpensive. The synergy of low weight and strong structure is very unusual in a production sailplane and can only be achieved with careful attention to design and construction. This model is considered one of the best values on the market today. 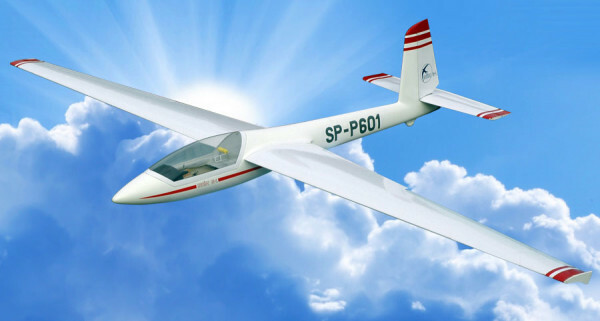 With its fiberglass fuselage and its carbon fiber reinforced, obecchi sheeted foam wings the Swift S-1 can handle full aerobatic routine. The careful use of composites with competition obechi, creates a good light structure that will hold its shape for a long time.